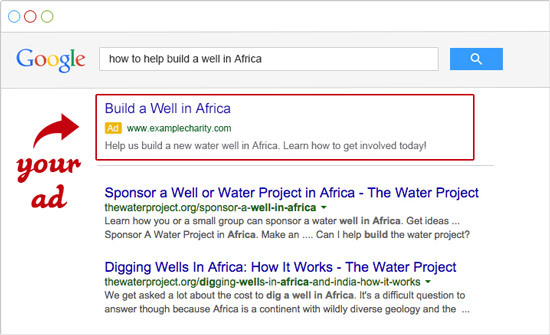 Is your favorite nonprofit using Google Ad Grants? If not, they’re losing out on literally thousands of dollars in free advertising. Help them show up in Google searches and get the word out. Google Ad Grants utilizes the company’s AdWords online advertising tool to provide nonprofits of all sizes with an incredible outreach opportunity — $10,000 worth of advertising, every month, for every qualified organization. It can be used to increase visibility locally, regionally, even globally. That means more donors. Additional volunteers. Stronger communities. And improved lives. What does a nonprofit need to qualify for Google Grants? Current and valid nonprofit status — in the U.S., this means a 501(c)(3) designation. Agreement with Google’s required certifications around receiving and using donations obtained through Google Ad Grants. A website that is functional, with adequate detail on the organization. We’ve guided many nonprofit organizations through the Google Ad Grants process, hosting a free monthly webinar (see recordings below / check out our blog for upcoming events) and then offering ongoing support to ensure this advertising is used effectively. With the right marketing mix and SEO strategy, any nonprofit now can easily reach more people and further its mission.